Need for media codecs is well known by now, even if it took some years to settle into well-tuned packages. Internally Windows uses flexible system of filters, video must go through, so that all codecs and software work well together. Sometimes those filters get broken beyond what can be fixed with reinstall of codecs. 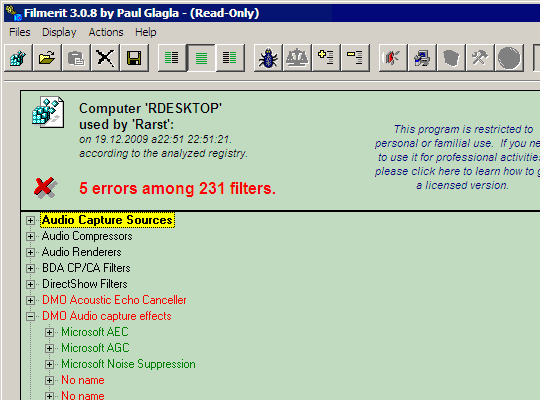 Filmerit is an utility that detects and corrects such broken filters. On launch app goes through all filters in the system and reports how many of those appear to be broken. By default it is set to read-only mode. You need to un-press lock button in toolbar and agree to warning if you need to make changes. You can browse filter tree manually (context menu lists available actions) or use scary-looking button with red button (yes, interface could be better) to attempt automatic fix. Frankly there are very few utilities that work with DirectShow filters, it is too obscure and rarely needed. Even less of those have any kind of automatic mode that won’t nuke your Windows installation. From my experience Filmerit is most thorough (more so than Codec Tweak Tool) and at few occasions helped fix very strange media playback issues. As many good older utilities this one is no longer developed and hadn’t been updated in years. I had not (and probably would not) tried to use it on newer Windows versions, but works it just fine on XP. Free for personal use, can be switched to portable in settings. Just hangs, minimised, (not responding) message in task manager W2K8R2. Tried running as XPSP2 and Admin and both and neither and no joy.